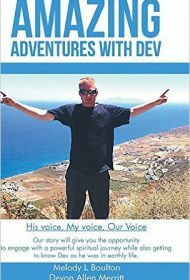 Amazing Adventures With Dev is Melody L. Boulton’s compelling and loving homage to her son, who died tragically at age 23, and is written with her son’s help from the spiritual realm. Just out of college and with his entire life ahead of him, 6’4”, blond, handsome, and popular Devon (“Dev”) Allen Merritt died unexpectedly from a rare illness known as interstitial lung disease. Grief stricken, his mother entered “the darkest and most painful aspect of my human reality.” When a parent loses a child, she writes, “wailing, growling, and gnashing of teeth are natural, primitive, visceral” responses. Boulton wrote this book to share her “Devon stories.” She intuitively knew that Dev’s spirit was “everywhere all the time,” and so she asked for his help. The book covers much of Dev’s life, from when he was a baby to his after-death communications. Dev’s messages to her appear in many forms, including rainbows, strange animal behavior, his voice coming through to her friends, and finally from a medium, who communicated things only she and Dev would know. In a book ostensibly about death, Boulton brings Dev to life with her unceasingly descriptive narrative, as well as plentiful photos. Honest, brave, and compellingly written, the story will enthrall anyone open to the subject of spirit communications, especially those who struggle with grieving issues.